While I did not have much luck with the Super Moon earlier this month, I decided to create a blue hour version by using a long exposure to build up the sky’s blue color. 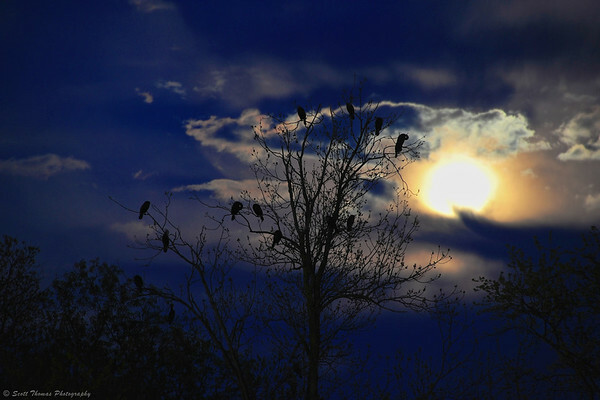 Cormorants roosting under the super full moon in Baldwinsville, New York. Nikon D700/28-300VR, 2s, f/8, ISO 200, EV 0, 300mm focal length, tripod. 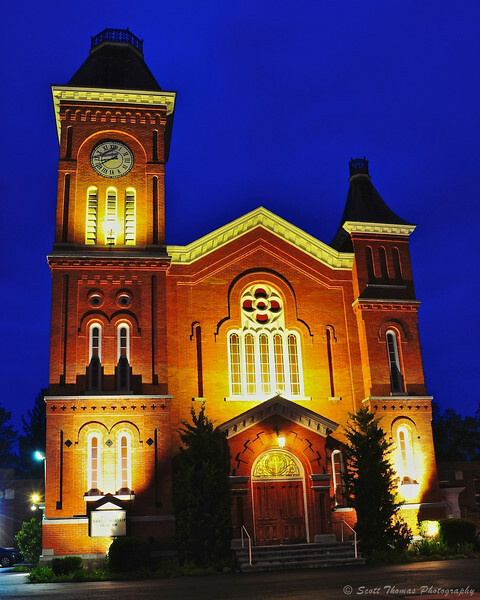 A few days before the Super Moon, I accompanied members of the Syracuse Photographers Association Meetup Group in a Spring shoot around Liverpool, New York. It was another cloudy evening and the sunset was non-existent. I decided to wait for Blue Hour and took these photos of a couple of the churches in town. Liverpool First United Methodist Church steeple in Liverpool, New York. Nikon D700/28-300VR, 6s, f/11, ISO 200, EV 0, 180mm focal length, tripod. Notice the difference in the artificial lighting from the Liverpool First United Methodist Church and the First Presbyterian Church a block away. First Presbyterian Church in Liverpool, New York. Nikon D700/28-300VR, 6s, f/11, ISO 200, EV 0, 28mm focal length, tripod. These photos are my submissions for Assignment 19: Blue Hour. This entry was posted in Assignments, Nature and tagged 28-300mm, baldwinsville, birds, blue hour, buildings, church, clouds, cormorants, first presbyterian, first united methodist, liverpool, moon, new york, night, nikon D700, steeple, super, tree, vr. Bookmark the permalink. 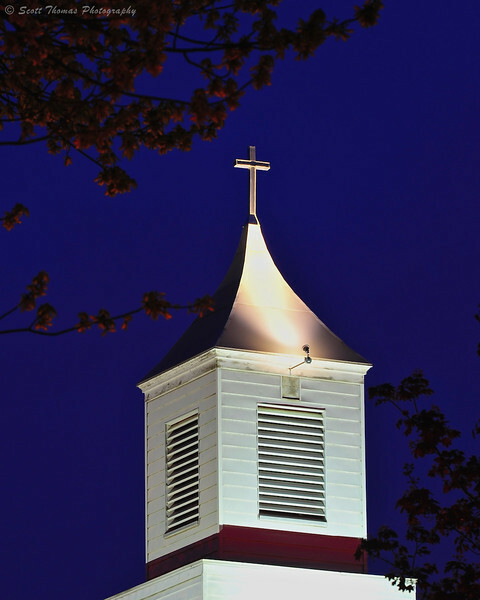 Beautiful shots, the steeple is especially simple and lovely! Thanks, Barbara! That is what I liked about the steeple, too. Very beautiful blue hour photos, especially the third, this is my favorite. I wonder how many different blue tones there would be to catch in “one blue hour session”. Golly, that’s a good question. Once the “blue hour” starts there is no telling how long it will last. By varying the shutter speed, you can create different shades of blue. Bummer, Karma! If you do capture it in the future, let me know! Did you have any issues I could help you with? I’m not sure Scott. I tried some of the aperture and shutter speed settings you mentioned, and used a tripod, but often the picture lightened too much, rather than becoming more blue. I could send you a few, along with the settings used, if you are interested. I would be interested. Send them along, please. Very special and beautiful ! The first picture is a dream in blue, I love it. I did not participate this time, sorry Scott, I just did not manage to get the “blue” of this magic hour. I guess this was a tougher assignment than I thought. Hope you can find some mountain blue hour to share with us someday, Isa.